One demographic has plagued Obama since his primary duel with Hillary Clinton: white voters without a college degree. Although Obama ultimately won enough white non-college voters to win the presidency in 2008, his performance was underwhelming by historic standards. And over the last four years, Obama’s already tepid support among white voters without a college degree has collapsed. At the same time, the “newer” elements of the Democratic coalition—college educated and non-white voters—have continued to offer elevated levels of support to the president. The latest polls show this trend continuing, indicating an unprecedented education gap among white voters—a gap that could put Obama’s electoral chances in jeopardy. Let’s dig into the numbers. 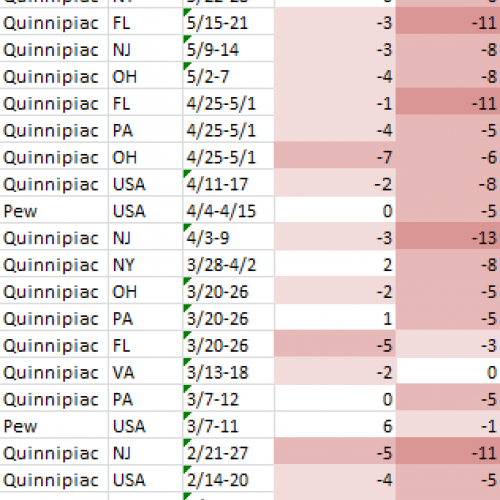 Since February, 25 state and national polls from Quinnipiac and Pew Research disaggregated Obama’s standing against Romney by educational attainment. The dataset has weaknesses, as the Quinnipiac state polls sample six somewhat unrepresentative East Coast states. Even so, the degree of consistency across the six states and the six national polls is striking: Of the 25 polls, 22 show a larger drop-off among non-college educated white voters. On average, Obama has lost nearly 6 percentage points among white voters without a college degree. Given that Obama had already lost millions of traditionally Democratic white working class voters in 2008, this degree of further deterioration is striking. In the three national polls conducted since April, Obama held just 34 percent of white voters without a college degree, compared to 40 percent in 2008. Thirty-four percent places Obama in the company of Walter Mondale, George McGovern, and the 2010 House Democrats. These are landslide numbers. At the same time, college educated white voters continue to offer 2008 levels of support to the President. In the same 25 polls, Obama lost an average of just 1.5 percentage points among white voters with a college degree. The national polls show Obama holding just as well, and the most recent Pew poll actually shows Obama improving on his 2008 performance among college educated whites. The uneven decline of Obama’s 2008 coalition has opened an unprecedented education gap among white voters. The current polls show that the education gap could nearly double, at least if Romney can persuade the undecided white working class Obama ‘08 voters with reservations about Obama’s performance. In 2008, Obama lost white college graduates by four points and whites without a college degree by 19 points. If the national polls are correct, and Obama currently holds approximately 35 percent of the white non-college vote, then Romney has an opportunity to win white non-college voters by 30 points. If Romney does so, the education gap would increase from 15 points in 2008 to 26 points in 2012. For comparison, the vaunted gender gap was 14 points in 2008 and 13 points in the most recent Pew poll. The emerging education gap could rejigger the electoral map, leaving Obama well positioned in states where Obama is less dependent on the support of white voters without a college degree—the educated and diverse mid-Atlantic and southwestern states—but giving Romney an advantage in states where Democrats need white non-college voters—the traditionally Democratic Midwestern states, where nearly half of Obama’s 2008 supporters were whites without a college degree. Of course, there’s no guarantee that the growing education gap manifests uniformly across a diverse country. In 2008, Obama received about the same share of white voters without a college degree as Kerry in 2004, but that national-level stability belied big regional shifts. 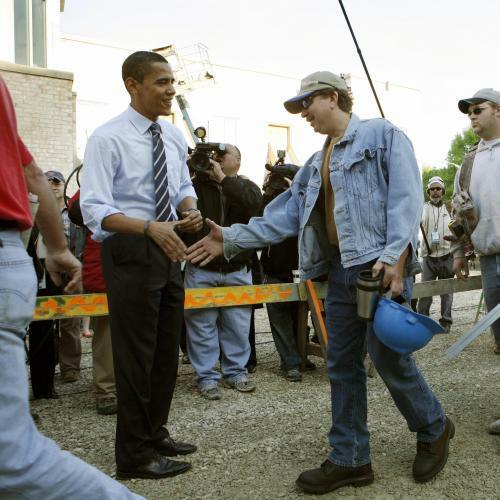 Obama had made significant gains among white working class voters in the Midwest and West, vaulting traditionally Republican states like Montana and Indiana into the toss-up column. At the same time, white working class voters in greater Appalachia and much of the rural South either didn’t vote or switched to McCain, leaving Obama routed in historically competitive states like West Virginia and Arkansas. Unfortunately, there isn’t yet enough data to determine the geographic distribution of Obama’s white non-college defectors. Even so, wide variance in Obama’s dependence on white non-college voters points toward the possibility that Obama’s chances in Wisconsin could be in jeopardy, even as Obama’s narrower margins in Virginia and North Carolina appear intact. This means that Obama’s strong showing in the Wisconsin recall exit poll takes outsized significance in this context. If Obama’s enduring strength among educated and non-white voters keeps Obama competitive in traditionally Republican states like Virginia and North Carolina, but Romney doesn’t get his end of the bargain in Democratic-but-white-working-class states like Wisconsin, the electoral map starts to look a lot better for Obama. On the other hand, Wisconsin’s demographics give the Romney campaign cause to at least initially contest the state, even if the current polling looks unfavorable. There is, however, a potential upside for Obama in all this: Despite the president’s diminished standing among less educated white voters, Romney has not yet convinced disaffected voters to join his cause. Instead, many of these voters remain undecided, and Romney still trails McCain’s eventual tallies in many of these polls. In all but one of the 25 polls, less educated whites were more likely to be undecided than college educated whites. In the six national polls, 5 percent of college educated whites were undecided compared to 9 percent of whites without a college degree. Romney’s road to victory starts with consolidating disaffected voters who do not approve of the President’s performance. Unsurprisingly then, the Obama campaign’s initial wave of advertising appears well-suited to disrupting those efforts. Depicting Romney as a plutocratic corporate raider seems likely to resonate with working class voters, especially since many traditionally have voted for Democratic presidential candidates. On the other hand, most of these voters harbor deep reservations about Obama’s performance and probably voted for Republicans in the 2010 midterms. Romney’s main goal in the coming months will be to convince them to join his cause.